There and Back Again: An Elf's Endeavour: CC: Yak Attack! 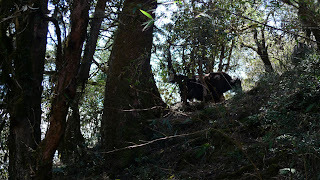 Got charged by a wild yak today up on a steep path off the main track. Too bad old four legs couldn’t scramble down to a lower platform like I could (and oh how I scrambled). Makes a much better story than an experience. Not fun.